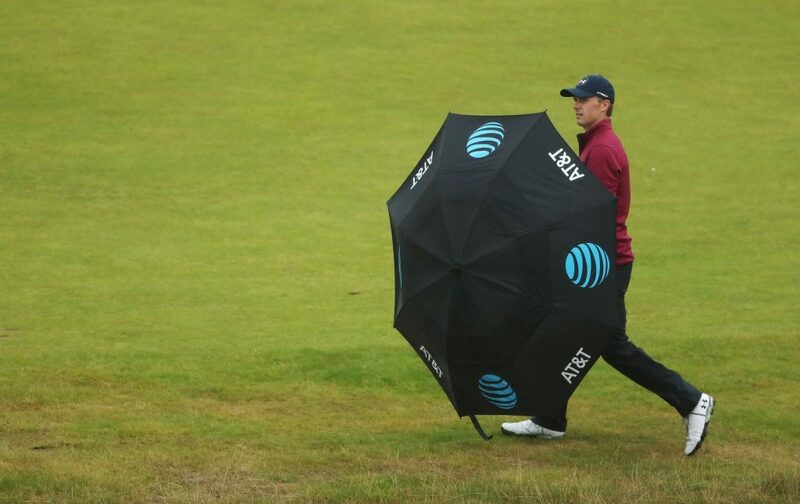 Jordan Spieth shelters from the rain under an umbrella during the second round at Royal Birkdale. The weather really won the day, but Jordan Spieth may now be in position to win the weekend and most importantly the Claret Jug at the 146th Open Championship. Deluges of rain and strong winds had the packed galleries at Royal Birkdale cowering under quivering umbrellas or scampering for the exits in the afternoon. The players were hardly more comfortable and probably envious. But although marooned in the part of the draw suffering the worst of it, the 23-year-old Texan emerged with a two-shot lead for the weekend, coping admirably with everything the weather gods threw at him. Spieth was maybe fortunate that the wind abated a little just at the key point of his round. But he grabbed most of the opportunities that opened up, rode a few mistakes and at the end had edged out in front. He must now be a strong favourite for the Claret Jug he maybe should have won in 2015 at St Andrews. His second round 69 – one of only a handful under par all day – leaves him at six-under, two clear of Matt Kuchar, who finished much earlier in the day, and had every right to believe then that he’d still have the lead by the end of the day. Ian Poulter, after a typically gutsy 70 in probably the worst of all the weather, shares third with Brooks Koepka, who didn’t enjoy the wet weather examination but is still in range after a 72. When the 39-year-old Kuchar came off just after midday with a 71, it seemed he’d set a target at four-under that was rock solid. The wind was blowing strongly, and the forecast rains had still to come. The Georgian was looking forward to watching the afternoon starters “one hundred per cent”. “I think that’s one of the cool things over here, Thursday or Friday, whatever your morning round is, getting to go back to the room, put on the TV and watch the guys play in the afternoon, and particularly in tough conditions,” he said. Not to be too hard on Kooch, that’s just what we all – including Spieth – thought at the time; the promise was for sideways rain and the later starters copping the bad end of the draw. But the weather forecast has been slightly off all week, and it proved so again. The rains showed up on schedule, and even brought play to a halt as some greens had to be cleared of standing water. But after the heaviest downfall, the wind – the real challenge as always on links – dropped to nothing. It blew again a little more after an hour, but nothing as consistently strong as Kuchar and the morning wave had endured. “I would have gladly stayed on the couch where I was watching the play this morning if I’d been offered even par. I’d still be there right now,” said Spieth. But it didn’t quite turn out that way, as he conceded. “We had a stoppage and it got calm for an hour. That period from the 10th through 12 was really, really important. Is Spieth lucky, as he and some of his detractors seem to suggest? With the weather change perhaps, and there was an unlikely chip-in from the back of the 10th when it looked like he was staring a double bogey in the face. But beyond that, there was obvious relish in his eyes as he took on the challenge, and he even laughed when caddie Michael Greller’s umbrella blew outside in. Some of his peers shy from the discomfort of these conditions – rain on the PGA Tour almost always means you come off the course – but Spieth seemed almost to embrace it. And he seized on key chances, which suggests that luck really has very little to do with it. After the escape at 10, his first putt after the rain delay was dead centre of the hole from 25 feet at 11. He followed immediately with another birdie, engaging another gear. Even when he was bunkered at 15 and dropped a shot, he came right back again, an eagle three – despite a mishit second shot with his three wood – from 25 feet at 15 opening up a gap just as Koepka, his other co-leader overnight, started to wilt in the wet and slide back. There was another bogey – a three putt at 16 – and he could only manage a par at 17 after a rare poor tee shot. But he played the 18th in careful protection of his two-stroke lead. He admitted the tougher examination of the Friday at Troon last year had toughened him for this test. “What we played in last year as the worst I’ve ever played in,” he said. “We didn’t really experience anything like that today, it wasn’t what I expected when I was sitting on the couch this morning. As for the weekend, he knows this drill pretty well now. “Control of the ball on the tee is going to be the most important thing for me this weekend,” he said. “Right now I’m just happy to be indoors, but I feel good right now. It’s probably a dozen times now I’ve had a share of the lead in a major championship and you still get nervous.